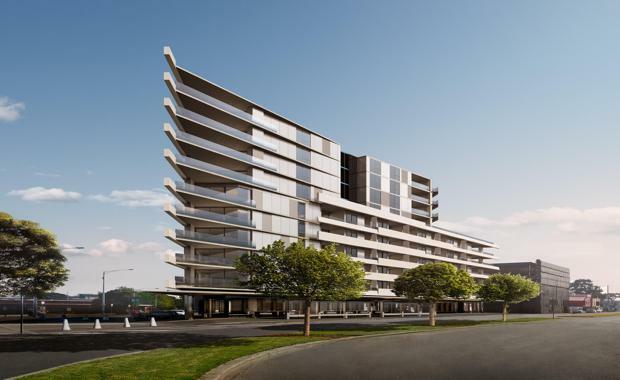 Construction of the 10-level triangular residential development Volaire will now commence as developer Cbus Property has appointed new builders to turn the first sod on September 26. Construction company Built was given the appointment and is expected to complete the development in mid 2018. “With a focus on quality design and green targets, Built shares our vision for the site to be the leading residential apartment product on Melbourne’s CBD fringe,” Cbus Property CEO Adrian Pozzo said. Designed by Hayball, Volaire features spacious entertainers’ apartments that share a residents’ lounge and rooftop garden with sweeping views. Once complete, Volaire residents will be just one stop from the CBD, with the island site adjacent to North Melbourne Train Station. Buses run each four minutes to the Hospital and University hubs of Carlton, and Errol Street cafes are a short stroll away. The development targets a re-emerging owner occupier market outside of the downsizer sector. As the property market becomes increasingly hard to break into, new purchasers are increasingly looking to apartment living that lends itself to entertaining. New Melbourne Apartments Speak To Young Home-Hunters]“A big portion of the 30-something and 40-something market are changing their housing expectations and targeting generous, well-designed quality apartments they can call a home,” said Mr Pozzo. Volaire at 9 Dryburgh Street features 154 apartments that pay homage to the suburb’s industrial heritage through its concrete, glass and timber aesthetic. With new cafes popping up and a ‘walk score’ of 92 per cent, the area has been likened to New York’s hipster suburb of Brooklyn 10 years ago, being poised for a Fitzroy style hipster evolution. Mr Pozzo said the success of Assembly in North Melbourne told him there is a demand for a similar level of design and functionality in inner suburban apartment living. More than 60 per cent of the building will feature expansive two bedroom apartments, many with two bathrooms and custom built in dining tables, in an appeal to the growing young professional and discerning first homebuyer market.